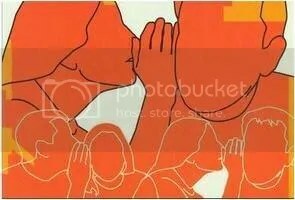 Word of Mouth Communication (WOMC) as a Potential Promotional Tool in promoting an organization, company, product, service, or even yourself. Public Relations is defined as “the practiced in organizations that range from giant, multinational telecommunication companies to small human service agencies and fledging social movement organizations” (Lattimore, 2004, p.5). Public Relations is a leadership and management function that helps to accomplish “organizational objectives, define philosophy, and facilitate organizational change” (Lattimore, 2004, p.5). Therefore in every organization or institution Public Relations has important roles to gain positive image from its public and to maintain internal and external relationship. The essence of Public Relations, which are creating positive image from the public and maintaining relationship in order to achieve the organization goals, should be prioritized by the institution. Although Public Relations and Marketing officers already maximized the promotion using many promotional tools, it could not be effective if they do not deliver the message clearly and suitable to the products or services that are offered. 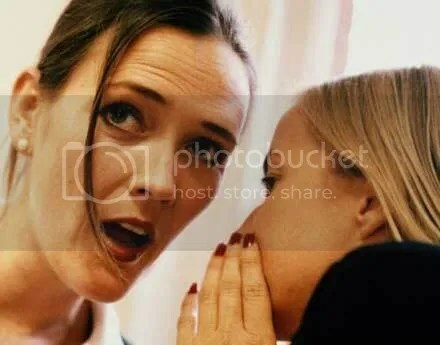 That is why in IMC there is one promotional tool that many Public Relations and Marketing officers forget, it is Word-of-mouth Communication (WOMC). As Walter J. Carl (2005), said that peer-to-peer conversations and recommendations are among the most trusted forms of communication. WOMC has strong influential power in leading and guiding messages received when searching for information, allocating searching efforts, and undertaking the decision process (Thakor & Kumar on Carl, 2005). WOMC can be encouraged and facilitated. Companies can work hard to make people happier, they can listen to consumers, they can make it easier for them to tell their friends, and they can make certain that influential individuals know about the good qualities of a product or service (WOMC 101, a WOMMA white paper, 2006). 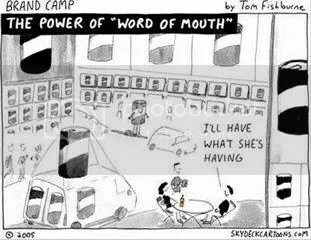 Word-of-mouth communication (WOMC) is one of most influential decision making factors in the service purchase decision and yet it remains beyond the control of marketers both for individuals and organizations (Swan & Oliver; Wee, Lim & Lwin on Carl, 2005). There are two types of WOMC which are Organic WOMC and Amplified WOMC (Carl, 2005). Organic or Natural WOMC occurs naturally when people become advocates because they are happy with a product and have a natural desire to share their support and enthusiasm. Practices that enhance organic WOMC activity include, focusing on customer satisfaction; improving product quality and usability; responding to customer concerns and criticism; opening a dialog and listening to people; and earning customer loyalty. Organic WOMC is arguee to be more effective because it is a reflection of customer satisfaction and it is an ethical PR practice (Carl, 2005). While amplified WOMC can be potentially unethical if the procedure or act that is used by which corporations seek to influence buying decisions is not a proper way. For instance to create the impression that a person is an actual consumer describing one’s experience with a product when the person is not an actual consumer (e.g., a paid third-party posting information on blogs or message boards, the message that is delivered is not the truth or real information, and so on). WOMC can greatly affect the impact of message. Whatever it is called, WOMC is cheap because it does not rely on expensive media buys. It can, however, be reinforced by media stories, which is where public relations come in (Holmes, 2000). WOMC is a powerful tool because of its high level of credibility. And, if the topic is hot, it can spread like wildfire (Belch and Belch, 2004). The major theoretical model that has been chosen is the Basic Model of Communication, which is shown in Figure under (Belch and Belch, 2004, p.139). This model is the most appropriate due to the fact that WOMC fit under its scope. 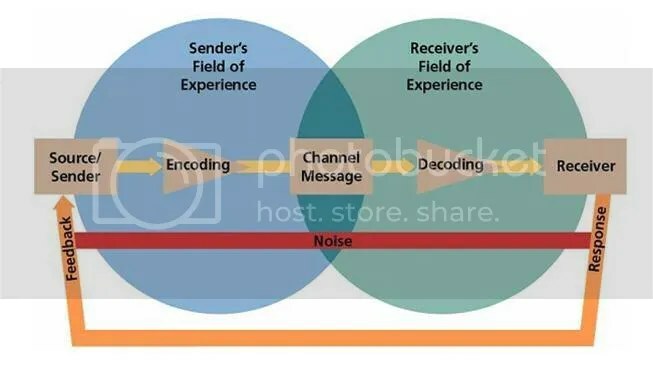 This model provides the basic model of communication where the source or sender encodes the information or message based on sender’s field of experience. Then message is sent through channel. After that, the message will be decoded by receiver based on receiver’s field of experience. The communication process after the receiver received and understood the message, he or she wills response and giving feedback to the source. At any process of communication noise would become the barrier and distort the process (Belch and Belch, 2004). In order for the communication process to be effective, “the message decoding process of the receiver must match the encoding of the sender” (Belch and Belch, 2004, p.141). The basic model describes all forms of communication – including traditional advertising and consumer-controlled advertising, which is WOMC. However, it is the differences between these two forms of promotion which are essential to the success of each. In terms of the basic communications model, there are certain areas of the actual process which are applicable to both WOMC and traditional advertising. These applicable pieces of the promotion process are the sender, the message, the channel, and the receiver. In addition, noise and fields of experience also influence the process. The communication process for WOMC is fundamentally different from traditional advertising. The most basic difference is in the sender. In the case of WOMC, the information begins with the agent of WOMC, who is the original sender. Instead, conversations form the channel in which the information is transmitted. The conversations are classified as personal channels, meaning that the receiver knows the person who is sending him the information (Belch and Belch, 2004, p.143). This distinct channel is the dominant difference between WOMC and other forms of promotion or advertising. Because the channel is a conversation between two people, the brand advocation has no limits. Also, it breaks through the clutter more effectively because it is more difficult to ignore a brand advocation from someone with whom you are speaking. A sender can utilize a conversation (in the offline or online world) to send product information to a receiver. Upon decoding the information, the receiver can then become a sender and open another channel of communication with a new receiver. The WOMC spreading effectiveness model explained the factors that could establish the positive WOMC spread effectively in educational services. 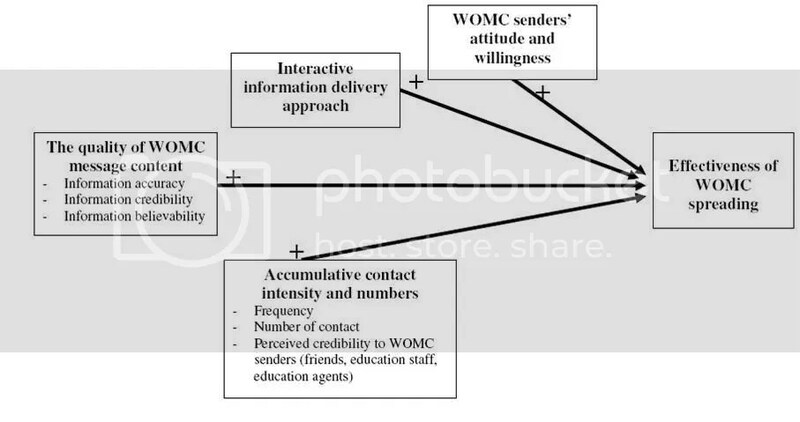 The factors which are WOMC senders’ attitude and willingness, interactive information delivery approach, the quality of WOMC message content, and accumulative contact intensity and numbers would lead to positive WOMC spreading effectively (Chen, 2006,). For participants, excellent information content should include three aspects: information accuracy, credibility, and believability. (Chen, 2006). The higher WOMC message content quality “(information accuracy, credibility, believability)” leads to the higher possibility to attract prospective students. “Number of contact with WOMC message providers accumulates the strength of relationship (Chen, 2006, p.183).” Whenever participants faced potential concerns or practical issues that needed to be solved, participants often tended to enquire through face-to-face communication with WOMC senders. Frequency and number of contact would perceive credibility to the WOMC senders. “Friends are the most influential WOMC senders” but sometimes family also could become the strongest one in decision making (Chen, 2006, p.183). The concept shows that the WOMC source sends the message based on attitude and willingness to share and to tell the information through channel with the information delivery approach to the WOMC receiver. The WOMC receiver will influence and accept the message when the WOMC message content has accuracy, credibility, and believability. The message represents the first of two locations where the sender’s field of experience overlaps with the receiver’s field of experience. 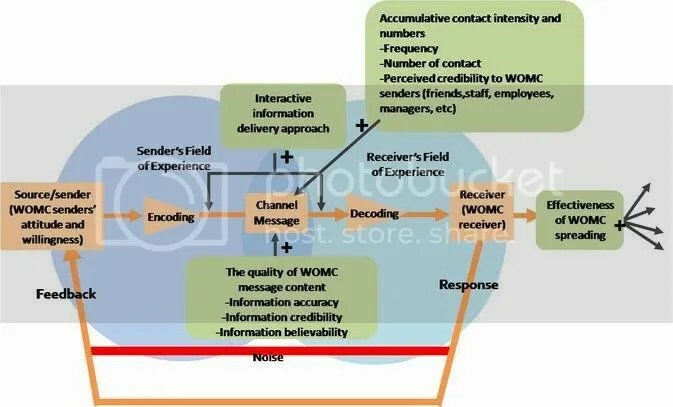 The process of accepting the WOMC message is also influenced by the accumulative contact intensity and numbers of both parties in order to establish credibility. When the receiver accepts the WOMC message, he or she will give the response as a feedback to the sender and spread the WOMC to the other. WOMC has important role for marketers in promoting a new product or service. The role was explained by Gilly, Graham, Wolfinbarger, and Yale (1998) in Academy of Marketing Science Journal, A dyadic study of interpersonal information search, below those personal sources take part in WOMC. “Marketing researchers have found that personal sources play a particularly influential role in affecting product choice, selection of service providers, and in the diffusion of information regarding new products. Personal sources often are rated by consumers as the most important source of information, especially when the information seekers perceive high risk, or when consumers are generally susceptible to interpersonal influence” (Gilly, Graham, and Wolfinbarger., 1998, p. 83). Therefore WOM (Word of Mouth) communications have been studied as both an input into consumer decision-making and an outcome of the purchasing process. 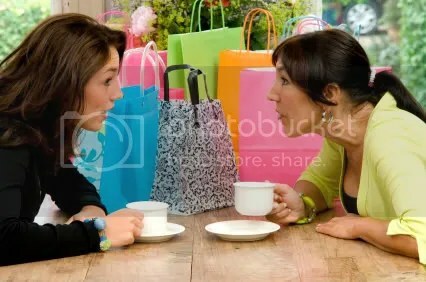 One of the most widely accepted notions in consumer behavior is that word-of-mouth communication plays an important role in shaping consumers’ attitudes and behaviors (Brown and Reingen, 1987). There are four unique influential factors that would stimulate consumers to initiate WOMC. “These factors include incentives, social ties, cultural influences, and customer satisfaction” (Chen, 2006, p.41). On the other hand, the marketer should increase the level of consumers’ incentives in order to gain a positive purchase recommendation to influence prospective customers. Therefore, when consumers receive WOMC messages from strong social-tie WOMC senders, WOMC messages directly influence consumers’ purchase decisions. Based on explanation above, we could know that when service quality does not meet customers’ perceived standard, consumers are likely to initiate negative WOMC activities to directly contact numbers of prospective customers. Moreover, the key influential parties to be included as a part of the marketing target audience (WOMC sender) in WOMC promotion are who are frequently close to consumers (Lau & Ng on Chen, 2006, p.45). Previous consumer experience and expectation as well influences the levels of service satisfaction. Burton on Chen (2006) concludes that “experienced customers tend to have higher satisfaction standards to measure service providers’ performance.” If the expectations of service quality are met with experienced customers, they would tend to be more satisfied than novice customers. Moreover, for experienced customers, a small positive improvement in service quality may not result in any improvement of satisfaction. Berikut Notes of the week! hi april, thanks for your interest to WOM..
before I entered PR major, i got lot of knowledge in hospitality industry by entering the Hotel and Tourism Management. So I had a bit of knowledge about this lovely industry: SERVICE IS THE #1! service is the hottest part in hospitality industry, it can trigger the word-of-mouth both negative and positive WOM (identified as organic WOM). So, maintain your service excellently to boost the organic WOM. but what if I want to create the amplified one to grow the organic one? – start from your employee: talk, discuss, and engage with the hotel employee. Employee can be a promotor to spread the WOM about the Hotel. – I recommend create a guerrilla campaign program to create the Buzz in the public domain. Start with your Guests, then make it public. -trust me, it really works, especially for hospitality industry. hopefully this brief answer can help your curiosity. Please ask me if you want to talk more.